So many stories about songs become folklore and people forevermore believe it’s true. I’ve used this example before and I’ll use it again, if you ask the average music fan in the street who played the mouth organ on Millie’s 1964 hit My Boy Lollipop they’re likely to say Rod Stewart. People who are more informed will tell you it’s actually Pete Hogman. 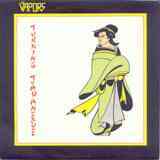 Another example that has been around for years is the subject meaning of the Vapors’ 1980 hit Turning Japanese. Ill-informed journalists and trivia-writers have long since passed on the ‘fact’ that it’s about masturbation because Turning Japanese refers to the Oriental facial expression people pull at the moment of climax whilst holding your sausage hostage. Actually it isn’t about that at all. There was also talk at the time that certain members of the band had a fascination with the Japanese culture, which was rubbish too. There really is only one small connection to the East and that it the guitar sound that opens the song. That recognisable riff which is also repeated a few places in the song is actually called the oriental riff and is generally used when a Western band wants to invoke the sound of the Far East in a song. Other examples of this are Carl Douglas’ Kung Fu Fighting and Siouxsie and the Banshees’ Hong Kong Garden. The Vapors were a pub-rock group from Guildford in Surrey and were formed by singer David Fenton, guitarist Edward Bazalgette and included Steve Smith on bass and Howard Smith on drums. They originally spelt their name The Vapours, but decided to drop the ‘U’ to make people think they were American. Bruce Foxton of the Jam discovered them and went on to co-manage them with Paul Weller’s dad John. Bruce invited them to support The Jam on their Setting Sons tour. Dave Fenton explained in an interview about the title, “It could have been Portuguese or Lebanese or anything that fitted with that phrase, it’s nothing to do with the Japanese. It’s actually a love song about someone who had lost their girlfriend and was going crazy over it. The title is just all the cliché’s about angst and youth and about turning into something you didn’t expect to.” Early guitarist, Rob Kemp, who left before the band became successful, added, “A lot of David’s lyrics were about failed relationships.” David continued, “There’s this boy sitting in his room with just a photograph of the girl that had just left him and feeling very empty.” He must have had all these emotions going on that he could have felt like he was turning into a different person. This person was obviously so hurt about losing the girl that not only did he want a picture, he wanted a doctor to take an x-ray picture so he could look at her inside as well. Probably going a little bit too far but when in that situation, and most of us have been at some time or other, we do strange things. Turning Japanese topped the Australian charts for two weeks but was only a minor hit in Japan, maybe they took offence! It has also been used in America in adverts for both Dr. Pepper and KFC restaurants, the latter being sung as a karaoke version. Additionally it featured in the films Romy And Michele’s High School Reunion (1997) and Charlie’s Angels (2000). In January this year at St George’s School in Harpenden there were different types of events being staged to help raise money for three different charities. One house restaged the 1969 Woodstock Festival and another did a Top of the Pops event where David made a guest appearance giving them a rendition of Turning Japanese. They raised a total of £4,746.